Charles Blackman Alice on the Table at Etching House, Alice on the Table is a limited edition hand signed fine art archival pigment print on arches fine art paper. Alice on the Table image size is 73x67cm with a paper size of 84x77cm and is signed lower right. Is embossed with the Blackman seal of the artist lower left. Born in Sydney on 12 August 1928. He left school at thirteen and worked with the Sydney Sun, while attending night classes in drawing and design at the East Sydney Technical College from 1942-5 under Hayward Veal. Charles Blackman – A successful Australian contemporary artist represented in most states and provincial galleries. Charles Blackman has in many ways been an influence to many young as well as some established artists. His work has been extremely popular and has a strong broad appeal, his symbolic style of including children, flowers, gardens, cats, dreams all reflect emotions and compassion. Charles Blackman has an amazing 3613 recorded works sold since the 70s to and including 2004, in 2005 year to date July, his recorded sales is 112 works, these figures are excluding all gallery and exhibition sales nationally. The figures show a solid popularity and there has been an increase in demand for his work in 2005. Charles Blackman has brought much joy to Australians with his diverse range of subjects and mediums, some of the most popular being – Charles Blackman Alice series, School Girl series started in the 50s, Orpheus Suite – of which the 1998-2000 release of 12 Collagraph images, a limited edition of 70 sets has this month sold out completely with a current RRP of $66,000 a set. Charles Blackman has work being represented in Paris, London. Barbara Patterson a poet and who became Blackman’s wife in the 50s, suffered with poor eye sight, Charles Blackman in some cases portrayed in his work this affliction by darkening the eyes, PARADISE GARDEN from 1976 was a perfect example, it is a limited edition work and almost non existent in the market. Blackman moved to Melbourne in 1950 and became a member of the Antipodeans in 1959. He created haunting images of grave women and girls, detached from their surroundings, absorbed in daydreams or games and oblivious to reality. Charles Blackman today is still working and having his work released. The NSW Gallery has some great books on Blackman, one in particular is, The Paintings of Charles Blackman. Blackman has won many awards throughout his career, including the Rowney prize for drawing in 1959, the Helena Rubenstein Scholarship in 1960, the Dyeson Endowment Award and the Crouch Prize. Blackman’s work was included in the Whitechapel Open Exhibition in 1961 and Tate Gallery exhibitions of Australian Art 1962-63. A major retrospective, ‘Schoolgirls and Angels,’ was organized in 1993 by the National Gallery of Victoria, touring to Sydney, Brisbane and Perth. In 1997 Blackman was awarded an OBE for his services to art. His work is held in all Australian state and most regional galleries, institutional and private collections. 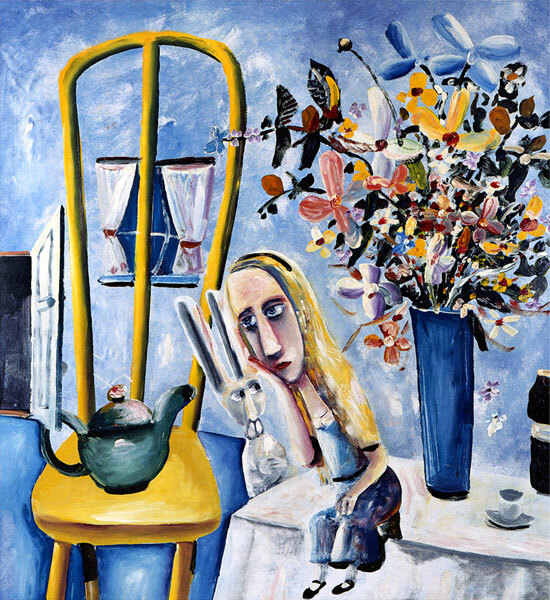 Charles Blackman ALICE popularly known as “The Golden Alice” is a portrait of Carroll’s heroine image. This ‘princess’ is conceived as a child-goddess with the potentiality and mystery of a Goldilocks, a Leda, a Europa or a Beauty, with their bestial counterparts in fairy-tale and myth – bears, swan, bull and beast. Carroll’s originality was to make this beast a benign rabbit, which Alice releases from its bestial form and then masculinises. In this centrepiece of the Alice series, Blackman gestates his own identification with the fertile Rabbit through the prescient objects – the pink teacup and the white tablecloth with pink reflection – of the restaurant where he cooked at night. The image of this rose-handled, cheeky cup – an echo of Alice’s shining complexion – hovers above the peak as the white tablecloth encroaches into her domain. The open profile of the blue chair, on her other side, forms a cradle for her dissolving body image with its crude arm. Here, within the passion of her embrace, is the Alice a secret garden -a smouldering bouquet, wellspring of creation and carnality in the eternal female. It is from this bouquet that the seeds of inspiration flame up and through her golden hair, sending creative sparks into the hinterland, more bushfire than sunlight. Charles Blackman’s imaginative conception of, and conception with, the eternal woman resonates with his own life and with the persona of his wife and muse. Their first child was conceived on the opening night of Sidney Nolan’s ‘Kelly’ paintings at the Gallery of Contemporary Art in Melbourne. The occasion clearly touched a nerve and spring-boarded the scope of his vision for the Alice paintings, which were then in their early stages. The blue veil across her glance – a symbol of Barbara’s blurred and fleeting eyesight and her psychic vision – complements the empty slit of the Kelly mask; Alice’s triumphant heroine figure answers the centaur-like iconic image of Ned Kelly, the key of Nolan’s series; and the golden ground, freely scum bled over pure blue, red and yellow takes up the challenge of the sunlit ‘Kelly country’ plains. No wonder that Sunday Reed, who was Nolan’s muse in the ‘Kelly’ paintings, treasured this Alice, which she bought at first sight. When Alice was damaged by flying glass (a blown-out window in 1967), John Reed described the event as a ‘catastrophe’. He went on, ‘We are both very shocked by this, particularly because Alice has been on the walls since we moved into Heidi II and we have both been especially aware of her and involved in her Poor Alice, she looks a little surprised that anyone should do such a thing to her. Blackmans Alice is a suite of six silkscreen prints limited to an edition of 75 plus Artist Proofs. There have been many illustrations of Alice’s Adventures in Wonderland since it was first published in 1865, at the last count there where over a hundred. Blackman has not illustrated Alice; he has in his own way discovered her. Blackman discovered Alice when he was quite grown up and the impact of his discovery coincided perfectly with his readiness as an artist. It was a magical experience for Charles Blackman, for Alice lives in a world where anything can happen. She brought him freedom that naturally took him close to the essence of the story. Charles Blackman is a great Romantic artist, a painter of dreams and emotions. Charles Blackman’s ‘Alice’ paintings made in the early 1950’s where among his first important works. Lewis Carrols immortal words tell us the story set us sailing to Wonderland; Blackmans paintings give us the heart of Alice. “The white Rabbit came into the kitchen and helped me cook the dinners” said artist Charles Blackman, who was working as a cook in a French restaurant in Melbourne when he painted his Alice in Wonderland series. “Then I would go home to my loft and paint The Rabbit and Alice”. Golden Alice on a summer’s day, her heart full of dreams, is not surprised when cups and flowers and rabbits float by or where things constantly change into other things. How can she be? She is the “dream child” morning through a land of wonders and new. Charles Blackman at Etching House for fine art limited edition etchings, silkscreens prints, and lithographic prints. Charles Blackman and Rolf Mende from Etching House chat at State Library NSW Berkeley’s 30th year celebration. The ever charming and delightful Australian artist Charles Blackman graciously chatted with Rolf Mende from Etching House, Charles is well and a real character, Charles was telling me about his celebrations coming up in Melbourne soon, and how much he loved the art world, he was telling me about Jeffrey Smart and how he lives in Tuscany and he is a marvellous Australian Artist, we spoke about limited edition affordable prints and etchings, Charles said he really loved them and felt it was a way of sharing art with the public, Charles Blackman is defiantly a well loved Iconic Australian Artist who supports the art world with passion, something we share with him dearly.